Tenderly hold by the hands of my Vivetta blouse. Red and white, I love this colours together, even if I'm not used to wear white. 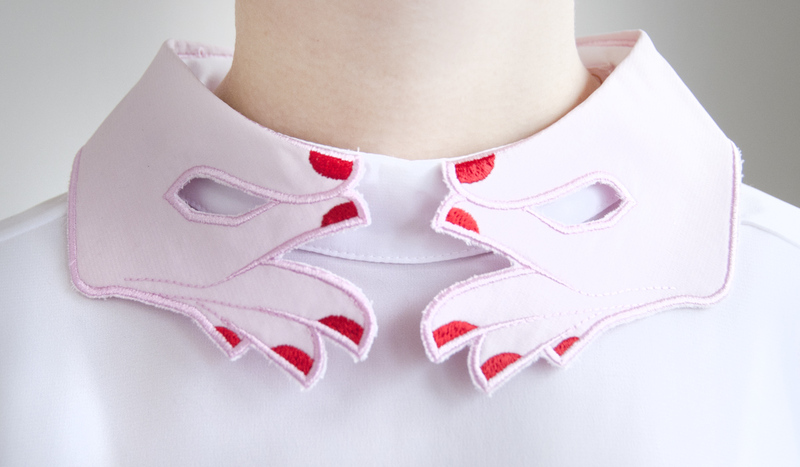 This collar is so amazing and reminds me of Schiaparelli. Elegant, but not without humour. Sweet vintage earrings, made of tiny bells. They slightly jingle when I move. Cheetah shoes and knee socks for a little bit of girlishness. Surrealism in fashion had always some kind of a magical attraction to me. I love all the old pictures of Elsa Schiaparelli and her crazy creations, like the shoe hat or the hand belt. When I first discovered the Italian label Vivetta, I had to think immediately of Schiaparelli. Many of their designs look like a more cute and girly way of things, Elsa could have designed. I won this amazing blouse from the current Vivetta collection in a competition at Dotti's, one of my favourite stores in Zurich. Dotti's started as a vintage store and still sells the most amazing dresses from past times. A few lovely labels such as Bernie Dexter, Vivetta and Frollein von Sofa, joined the shelfs recently. I am very delighted about my luck in the competition, because I secretly admired the blouse for a long time in Dotti's online store. The blouse is very smooth and elegant. It is probably the first white blouse I ever owned. I am always a little bit careful about wearing white. With my pale complexion and fair hair, I am afraid it might make me appear too pale. I would never wear white without makeup, but with a bright lipstick the look convinces me. The short skirt and knee socks makes the outfit cheeky, while the blouse is high-necked in a good girl manner. I think the finished look says "I am an elegant lady, but a cute school girl as well". With this, I already found my perfect outfit for Valentine's Day. What do you think about this look and especially the blouse? Thanks a lot to Dotti's for letting me win this beautiful Vivetta blouse. Die Bluse ist sehr, sehr schön und die Ohrringe sind ja der absolute hammer! Die Ohrringe find ich total süss, bimmeln sie auch? Die Bluse ist natürlich wieder eine absolute Wucht und für mich total Sara, cooool! Eins muss ich schon mal sagen, Ihr habt ein extrem sauberes Treppenhaus :-) Da kann man neidisch werden. I love Elsa Schiaparelli very much.Michelle Harper is on that line, too.but you are the glorious one, my dear princess. I adore the red and white, the collar and wonderful earring, ahhhhhhhhhhhh. Perfect pop of animal print. Much love and inspiration always,my dear Sara. eeeeps! That skirts is amazing and the collar on the shirt...so cute! woooow that collar is really freaking amazing, i agree it reminds me of schiaparelli too! how gorgeous, also that colourcombo of white and orange is so unexpected fabulous. love it! Hi Sara! I love the outfit and ADORE that collar! wooow, der kragen ist der knaller ! Ich liebe es ! This collar is the cutest thing I've ever seen!